Tour impresses you with its charismatic first impression. Even though, it is on the heavier side when compared to the other Blackberry phones, you kind of get used to it very soon. 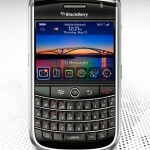 Its wider designing has made it probable for RIM to have a QWERTY keyboard. Its distributer Reliance Mobile, India’s largest CDMA subscriber will make BlackBerry Tour smartphone available in the market. What with its rubber texture on the rear side makes you forget that you are holding a mobile whilst sleeping. As a lot of guys relax and watch television and speak on their mobile. The silver lining is something to watch out for. Talking about the keys, the somewhat upwards keys makes it amazingly easy to type. By this invention typing the usually long messages is no problem at all. The Tour has a fairly good 3.2 Mega Pixel camera with a flash attached so to click photos and shoot video. But don’t go to gaga over it as the out put is passable though not too impressive. This mobile would have done good if it was bunched up with WiFi. There is by far no issue in transmitting data through Bluetooth both ways. The Tour sure is no big deal for software but of course you have a preference to get Opera for blackberry which is cool. Ok ok now again for the optimistic aspect of it. I believe that it is a CDMA but the point to be noted is that it has a provision for a SIM card while travelling, which sometimes can be very cumbersome with the existing SIM card. There is absolutely no necessity to buy another card especially while travelling abroad. SMS and Email work surprising good. With wide usage of email, twittering, facebooking, browsing and what not, the battery lasts for almost half a day or can be dragged to over a day if used a bit sparingly. But again network feasibility is next to zero when the battery level is low. 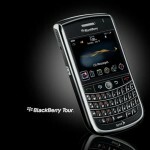 If you a techno savvy person then may be Blackberry Tour is great except for not having WiFi. With multimedia functions supporting email, social networking and a various other applications, this stylish black finish with chrome lights surround this lustrous device. Its advanced media player, a 3.5 mm stereo headset jack and a support for Bluetooth Stereo Audio Profile , comes with 256MB Flash memory built-in GPS with support, Its voice activated dialing, background noise cancellation, a low-distortion speakerphone, and Bluetooth (2.0) as a support for hands-free headsets, also car kits, and stereo headsets and other Bluetooth peripherals. These are only some of the greats of this latest addition to the mobile fraternity. Like any other mobile it has its own advantages together with a few hiccups. But on whole it is a set to be a proud owner of. Own it and enjoy its features.